Fun with the Gordon Growth Model Are Stocks Really Less Risky in the Long Run? The green cell background shows the option with the higher 12-month return, and the red cell background shows the option with the lower 12-month return. The final two columns show how $1000 would have grown under two investment scenarios. In the first scenario, all funds are invested in the year’s most admired company (no taxes or transaction costs are assumed). In the second scenario, all funds are invested in the S&P500. The results of the analysis show that the S&P500 index outperformed the “Most Admired Company” strategy even without accounting for trading costs or taxes. The $1000 invested in the S&P500 grew to $13,153, and the $1000 invested in the Most Admired Company grew to $11,319. 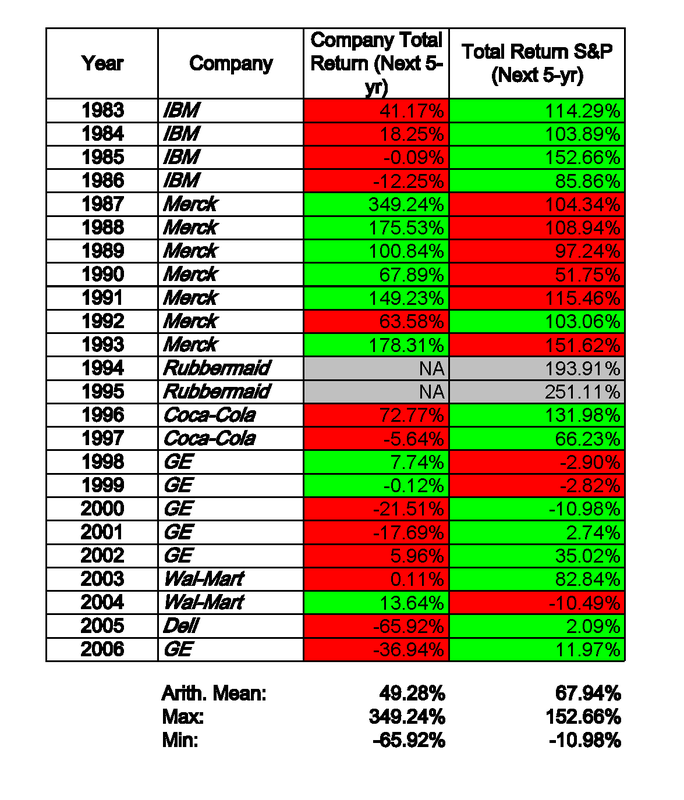 The S&P500 portfolio outperformed even though the arithmetic average return is higher for the most admired company strategy (for a discussion of why arithmetic and geometric returns can differ see here). The individual company strategy is also much more risky. The standard deviation of the annual returns is considerably higher. Investors in this strategy saw larger fluctuations in the value of their portfolio, but the strategy did not provide any additional return to compensate for the increase in risk. Note that 1994 and 1995 are shown in the table, but they are omitted from the analysis since Rubbermaid was acquired by Newell in 1999, and I haven’t been able to find the necessary historical returns for Rubbermaid as a stand alone company. Many investors hold onto company stock for many years, so I’ve also looked at total returns for the next 5-yrs for each most admired company and for the S&P500. The results are shown in the following table. In 13 out of 22 cases, the S&P500 outperformed the individual company. The total return over the 5-yr period was also higher on average for the S&P500, and the variance in returns was lower. This analysis shows that a diversified portfolio often outperforms a simple “great company” strategy. Over both the 1-yr and 5-yr time frames, the diversified portfolio outperformed more often than not and had lower risk. It is possible that a more sophisticated strategy might yield some better results, but investors should be careful about any investment philosophy or strategy which cannot stand up to careful analysis. The returns used in this analysis were calculated using the adjusted historical prices from Yahoo! Finance, and the Google Docs spreadsheet used for generating the tables in this post is available here. Update: DIY Investor suggests taking a look at the performance of the most admired company strategy using the returns from the year prior to the year they were selected as “most admired”. I tried this, and, as you might suspect, it made a dramatic difference. If we use the prior year returns, the $1000 initial investment would have grown to $545,047 (before taxes) when investing in the “most admired” firms, and it would have grown to only $19,981 with the S&P500 (the shift of one year means that I used a different range of dates so the S&P500 return doesn’t match the return shown in the trailing 1-yr analysis). Of course this backward looking strategy can’t be implemented in practice, and this dramatic difference in result just highlights the old saying that “past performance does not guarantee future results”. The spreadsheet for the prior 1yr analysis is available here. Interesting and creative post! Worth noting is that Enron was voted “most innovative” and was climbing the list of “most admired” before it imploded. Not diversifying, at least to some extent, can lead to underperformance and at possibly a big drop in assets. It may be interesting to look at the year prior to being named “most admired”. 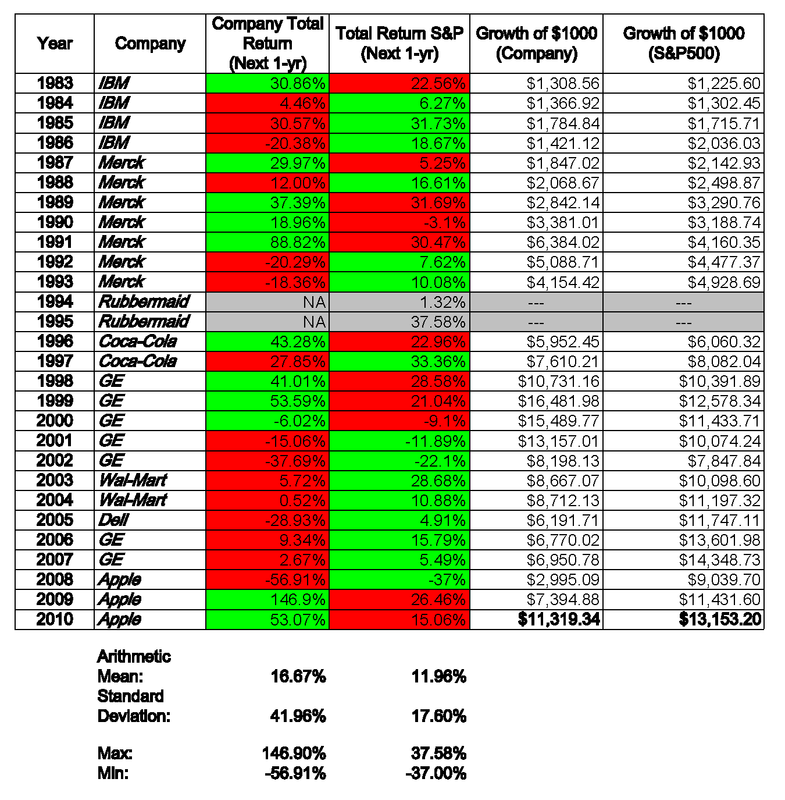 Thanks!, the idea of running the analysis with the returns from one year prior is a good one. I’ll try it out and add an update.